Africa has long gone ignored almost everywhere outside Africa. But now that oil is scarcer and the continent has plenty of it, writes journalist/historian Ghazvinian, drillers and diplomats are paying attention. 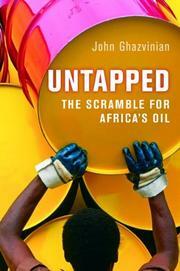 Since 1990, Ghazvinian observes, the petroleum industry has invested $20 billion in exploration and development in Africa. In the next three years alone, another $50 billion will be spent, “and around one-third of it will come from the United States.” Most of this exploration centers around the Gulf of Guinea, a nearly ideal location, since it’s offshore and thus perhaps not subject to the whims of landlubber dictators and corrupt officialdom and civil wars, things that plague places such as Sierra Leone and Nigeria; the Gulf also offers easily accessible sea lanes leading to Europe and the Americas, and, perhaps best of all, no sub-Saharan African countries belong to OPEC. Considering the sorry state of some sorry African states, notably Equatorial Guinea, an “overnight emirate” whose oil wealth goes straight into the ruling family’s coffers, the oil developers are wise to stay out in the deep. Even so, Ghazvinian notes, because of the rich reserves the Gulf of Guinea holds, certainly as compared to the “sour” oil of places such as Chad, West Africa is now being overrun and contested; Nigeria and Angola jockey for political dominance in places such as São Tomé and Principe, shady neocolonialists wander the streets of West Africa’s capitals and everywhere one looks, China is suddenly a major presence, having smartly committed to foreign aid and infrastructure development while the West was looking the other way. Ghazvinian’s grand-tour narrative has moments of lucid observation and sharp description that would do Graham Greene proud. Still, one wonders about his optimistic conclusion when past scrambles for Africa have hardly worked to Africans’ advantage.